Is it that guys here have not been scammed by Gakuyo and Banda homes or they prefer to suffer in silence? I expected fireworks and regrets on this wall. Am a victim of Dinara,8 years on still waiting for my title.Not a huge amount though but still large enough to cause me to join those who will be seeking justice. You got the land but still waiting for title or you have got both? Was never shown the land but I have a certificate.Waiting for the title and be shown the land. Several years of hide and seek by both directors.You call one he tells you to see the other then they stop picking calls after that. and to make it worse it was the ponzi loan she had been discussing on this forum before. How do you pay money before seeing the physical land? Hapo wewe pia ulikuwa too much. This is very common with the certificate thing. You go for a site visit and they show you land that is yet to be subdivided, or even it's subdivided you don't know which parcel is yours. So in essence huajona shamba yako since you don't know your parcel. Dinara identifies a 10acre piece of land and negotiates with the owner to buy at 1M per acre. He then subdivided the land on paper and gets the costing for each.Lets say in this case 100k per plot. So we all go and buy the number of plots one wishes to buy.A number is allocated and a certificate for it. Yes I have seen the main land but my small portion after subdivision not yet.Hapo ndio maneno iko. I thought the plot numbers are issued after subdivision? What number was indicated on the certificate considering that subdivision had not been done? Pole sana @bigchick. My apologies for defending the crooks. I mistakenly thought that they were running some genuine business. Kumbe I was also duped by their sleek marketing. The good thing with Banda is that they are actually building houses. So if one bought a house eg at Maple Ridge and feels that things are not moving in the right direction, they can actually move in and take possession of their designated house. So it's difficult to be scammed when they (banda) have actually built the promised houses. A scam occurs when someone takes your money and then doesn't build the promised house. The problem with your line of thinking is that you are assuming they are actually using all the money for the purpose intended for, however, in cases like these, the owners of the company often collect the money and use it for their own lavish living, in fact often times, less than 50% of the collected money goes into the intended use. So even if Banda built houses, don't be surprise the land under which the house is built is a collateral of a loan that is already in default or more than 1 person have the claim on the said units! Exactly!Now thats the con....lets not be naive else mtalia hapa hapa 2yrs from today. Formally employed people often live their employers' dream & forget about their own. @Hardwood when did it hit you that they are a con? I withdraw my statement. I was "misquoted". I think I got carried away by @bigchick's story (plus viceroy). Let's us give Banda the benefit of doubt. Banda will deliver. Why condemn them while no house buyer has complained? 30% is for us employees. The challenge Hardwood comes where the 'Robbing Peter to pay Paul' model hits a dead end like in case they run out of projects to sell (read Peters to rob). There clearly seems to be a funding gap and it is not entirely because of them taking installments. It appears from the allegations that there is money that disappeared from the system and this created the funding gap hence the delays in the delivery of earlier projects from the alleged associated companies. In that case they don't want to sell more units, they neeeed to keep selling more units. 1) The success of their projects if the allegations are true would be heavily dependent on continuing to sell more and more units. Once this stops, like possibly as a result of the circulating rumours, there will be a problem. The last to purchase will have funds be committed to other projects with no one to fund their units, almost like a pyramid scheme. They need support but they need to earn the support. I borrow 5mil to support guys who even have a hint of weak corporate governance structures?! Hehehe Nairobi ni shamba la mawe! Bernie Madoff took 30 years for his pyramid scheme to collapse, the guys selling greenhouses in Kajiado just took about 3 years before investors started rushing to court. There's no telling when and if the suspicious guys behind Banda homes will run out of money as they seem to have mastered the short-term game of avoiding negative publicity by simply rebranding to new companies, and unsuspecting buyers will keep pouring cash, until the game of musical chairs comes to a stop. Just like the greenhouse guys tricked people with cheques, maybe these guys are doing so with actual houses. All I know is, I wouldn't want to be the last investor left standing with no house and a huge loan to repay. Talking about greenhouse,I still see guys being seduced to "invest" in some greenhouse huko Citizen tv,just b4 prime time news. And every morning as I go to work they distribute these pamphlets on Banda ! Sad state of affairs.I hope this info is shared widely to make sure people don't get burned. 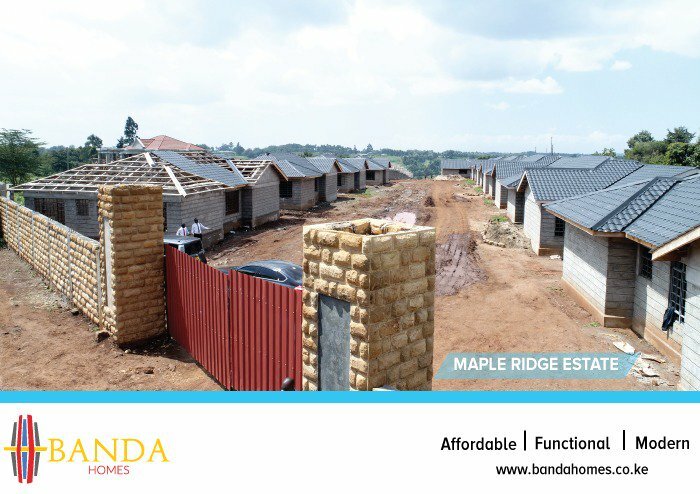 Could they already be morphing into another entity known as Mahiga homes? I note this company is also developing properties in the same vicinity, using the same model. Not saying they're one and the same thing; just asking.